When it comes to Cisco UCS servers, when you see a C in front of the model, like a Cisco UCS C220 you can simply assume it is a rack mount server. Likewise, when you see a B in front of the model number, you know it is a blade server, like the Cisco UCS B200. Today, I want to take a closer look at the Cisco UCS C220 rack mount server. In particular, the most current generation, which is the Cisco UCS C220 M5. As you can see from these quick specs (you can find the full details on Cisco’s site here), you can tell this server is a great choice for many workloads. When it comes to any Cisco products, Cisco Spec Sheets are your go to guide for everything you would ever want to configure. You can build a system by reading the spec sheet, and figure out all of your configurable options. If you are new to spec sheets, be sure to check out this guide on how to use them. If this is your first foray into the world of Cisco UCS servers, welcome! I also hope you have read the introduction to Cisco UCS architecture I have put together. I learned this the hard way a number of years ago, so I wanted to make sure I shared this tidbit of information for you. Click here for the Cisco UCS C220 M5 SFF – Small Form Factor drive – Spec Sheet. Click here for the Cisco UCS C220 M5 LFF – Large Form Factor drive – Spec Sheet. As I said, Cisco Spec Sheets are your one stop shop for configuring your Cisco UCS Server. When configuring your server, there are a couple of important considerations you must NOT overlook, or you will be in trouble when your equipment arrives. Managed. Where Cisco UCS Manager is used for management. Unmanaged. Where Cisco IMC (Integrated Management Controller) is used for management. Now, let’s take a brief look at these two modes of operation, which are covered in more depth in the Cisco UCS architecture guide. This configuration requires the use of UCS Manager, which is run on the Cisco Fabric Interconnects. These are separate pieces of rack mount hardware the Cisco C220 M5 would be connected to. Beyond management, all connectivity would be provided by the Cisco UCS Fabric Interconnects. The major benefits of this configuration are centralized management with Cisco UCS Manager, and the ability to abstract the Cisco UCS C220’s software personality from the hardware. Unmanaged Cisco UCS C220 M5. Simply connect your Cisco UCS C220 to network switches, turn it on, and manage it with Cisco IMC. This pretty much operates like any rack mount server you have ever encountered. The benefit of this is that you do not require additional hardware like you would to use UCS Manager, making it a good solution for remote and branch offices, or when only a few servers are required. Here is a diagram that shows the two modes of operation, with Managed on the left and Unmanaged on the right. After you decide what your requirements are, and which mode works for you, we have anther important option to discuss. 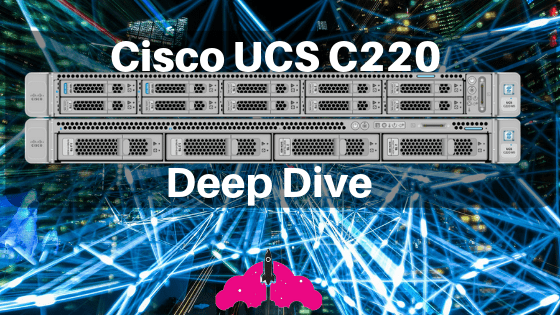 Cisco UCS C220 connectivity options can be really simple, or really complicated depending on how you look at it. If you are using a Managed configuration, and connecting g your Cisco UCS C220 to the Cisco UCS Fabric Interconnects, your connectivity options are the Cisco Virtual Interface Cards, or Cisco VICs. The end! Now, things can get a little crazy when it comes to the unmanaged configuration. Yes, you can use Cisco VICs, which is a great idea, or you can use other network cards from the spec sheet, which come in a variety of flavors. When you use a network card that is not a Cisco VIC, your server will behave exactly like any other rack server you have ever worked with, which can be a good thing sometimes. If you use a Cisco VIC, you have the option to carve up your Cisco VIC into multiple virtual interfaces, vNICs and vHBAs, just like you would in UCS Manager with the Unmanaged configuration. The number of vNICs and vHBAs varies depending on what Cisco VIC card you are using. All in all, the Cisco UCS C220 is a great server. It has a compact 1U size, but still packs a punch with two possible CPUs and 24 DIMMs. There is also flexibility in the deployment model, whether it be for a larger infrastructure with UCS Manager and Cisco Fabric Interconnects, or a smaller stand alone or remote branch office managed with Cisco IMC. The key to configuring your dream Cisco UCS C220 is of course, first figuring out your requirements. After that, the Cisco Spec Sheets (LFF here and SFF here) can be used to pick and choose the best components to meet your requirements. For an overview of Cisco UCS architecture, don’t miss this guide!